Storms battering the south coast have caused another part of the West Pier in Brighton to fall into the sea. The remains of the concert hall on the Victorian structure, which survived two fires and previous gales, fell into the sea on Wednesday afternoon. The Grade I listed pier, built in 1866 but closed to the public in 1975, is one of two piers in Brighton. The latest collapse means the ballroom is isolated in the sea after being cut off from the rest of the pier. The area was cordoned off by coastguard officials to ensure people's safety as gales continued to lash the former tourist attraction. Rachel Clark, from the West Pier Trust, said: "It (the concert hall) was always vulnerable but what we never expected was that we would have such a severe storm at the height of summer so we have been caught off-guard." 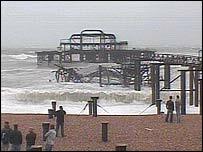 The pier was first battered by storms in January 2003 when sections fell into the sea. A fire in March 2003 then ripped through the structure stripping much of it down to its metal skeleton. A second fire then hit the pier in May. The West Pier Trust has continued to fight to restore the West Pier despite the Heritage Lottery Fund removing £14m it had allocated towards its restoration. English Heritage had also said it wanted to save the pier and was proposing to put fresh plans in place in September.